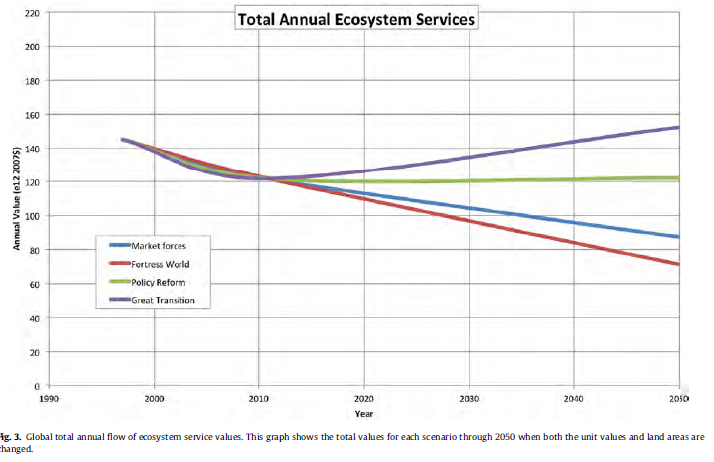 • Global ecosystem services value can differ by $81 trillion/yr by 2050 by scenario. • Land use change and management underlays our estimates. • We provide global assessments and details for every country. • Countries with deserts see the greatest effects. • The Great Transition scenario can allow a sustainable and desirable future. We estimated the future value of ecosystem services in monetary units for 4 alternative global land use and management scenarios based on the Great Transition Initiative (GTI) scenarios to the year 2050. We used previous estimates of the per biome values of ecosystem services in 2011 as the basis for comparison. We mapped projected land-use for 16 biomes at 1 km2 resolution globally for each scenario. This, combined with differences in land management for each scenario, created estimates of global ecosystem services values that also allowed for examinations of individual countries. 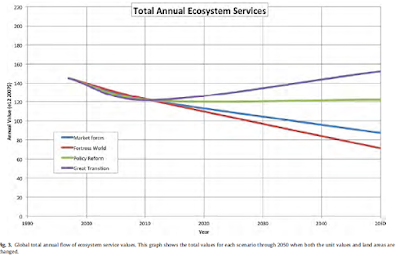 Results show that under different scenarios the global value of ecosystem services can decline by $51 trillion/yr or increase by USD $30 trillion/yr. In addition to the global values, we report totals for all countries and maps for a few example countries. Results show that adopting a set of policies similar to those required to achieve the UN Sustainable Development Goals, would greatly enhance ecosystem services, human wellbeing and sustainability. Putting the land areas and unit values together for each biome, the global total annual flow of ecosystem services values was estimated.... The total global values in both MF and FW were all lower than in 2011, dropping to USD $87.3 and $71.3 trillion/yr, respectively, from a 2011 value of USD $121.6 trillion/yr. The values in PR increased a small amount to USD $122.0 trillion/yr, mostly due to the fact that marine unit values did not change, forest and grassland/rangelands unit values decreased, and wetlands, croplands, and urban unit values increased. In the GT scenario, on the other hand, total global value increased to USD $152.3 trillion/year. The total global annual ecosystem services values when the unit values are unchanged from those used in 2011 and only area extents are changed for each biome. MF and FW decreased to USD $97.0 (11% more than with unit value changes) and $89.1 (25% more than with unit value changes) trillion/yr from 2011 total values, respectively, when only the area was changed, keeping the unit values constant. Total PR values remained the same at USD $122 trillion/yr while GT total values increased to USD $127.0 trillion/yr (17% less than with unit value changes) when unit values were kept at 2011 levels. This comparison shows that using 2011 unit values creates a pattern similar to that when the unit values are changed for each scenario. The only difference is that the change to the total values for each scenario is reduced. This occurs because the changes in unit values amplify the existing changes in area cover of the biomes. Changes in biome areas produce significant changes in global ecosystem service values, regardless of unit values. As a check on the effects of unit value specificity and spatial resolution and on the results, a comparison was done between the ecosystem service values for individual nations determined by this global model and more localized national studies. A 2013 national study found that the total ecosystem service value for the Kingdom of Bhutan was USD $15.5 billion/yr (Kubiszewski et al., 2013). The current global study determined that the total ecosystem services value of the same area was USD $14.9 billion/yr ..., only a 4% difference. A similar comparison was done for the country of South Africa. The current global study found that the total ecosystem service value in 2011 for South Africa was USD $476 billion/yr (Table 4). While a more detailed study found a total ecosystem service value for the same area of USD $515 billion/yr, a difference of just under 8% (Anderson et al., 2017). The relatively small differences found between the national studies and this global study suggests that the coarser spatial land use resolution of the global analysis and the use of global average unit values does not introduce significant differences in the total values, compared with higher spatial resolution national studies using more site specific unit values. Volume 26, Part A, August 2017, Pages 289-301; Available online 2 June 2017.